EucoClean Naturals Citronella & Rosemary is 100% Natural. Perfect Indoor and Outdoor Natural Cleaner. Leaves an Effective Natural Aroma that is long lasting. Can also Deter Dogs from re-digging areas. 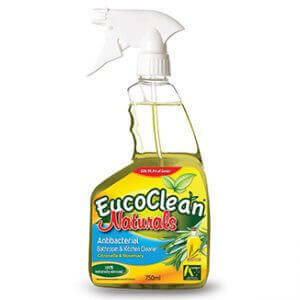 Soak a Cloth with EucoClean Naturals Citronella & Rosemary Cleaner and place in suspecting areas. (Garden Beds and Lawn Area) To Deter Pet from Digging your favourite Roses Hang Soaked Cloth with String from the Stem etc) To avoid being pricked always wear Thick Garden Gloves. Always re-apply after wet weather.